MMA promoter based in U.S.
World Extreme Cagefighting (WEC) was an American mixed martial arts (MMA) promotion founded in 2001. It was purchased by Zuffa, LLC, the parent company of the Ultimate Fighting Championship (UFC), in 2006. In its final incarnation, it was made up of 3 weight classes: 135 lb (61 kg), 145 lb (66 kg) and 155 lb (70 kg). To accommodate the smaller fighters, WEC's cage was 25 feet (7.6 m) in diameter—5 feet (1.5 m) smaller than the standard UFC cage. Scott Adams and Reed Harris started the organization in 2001. Between 2001 and 2006, most of their events were held at Tachi Palace Hotel & Casino in Lemoore, California, and aired on HDNet. Lemoore is a city in Kings County, California, United States. Lemoore is located 7.5 miles (12 km) west-southwest of Hanford, at an elevation of 230 feet (70 m). It is part of the Hanford-Corcoran Metropolitan Statistical Area. The population was 24,531 at the 2010 Census. The California Department of Finance estimated that Lemoore's population was 25,892 on January 1, 2018. In December 2006, Zuffa purchased WEC. With the purchase, WEC continued as a separate promotion with its own roster of fighters. Adams was retained after the purchase as the organization's matchmaker. Harris and Adams were named co-General Managers and were both active in the new WEC. In 2008, Sean Shelby was named the new match-maker for the promotion by Zuffa. Zuffa made several changes to the promotion after the purchase. It discontinued its pentagonal cage for a modified version of the UFC's octagonal cage. The championships of fighters who were contracted UFC fighters were vacated. The promotion moved to focus on lighter weight classes, abandoning their heavyweight and super heavyweight divisions and championships, and retaining their bantamweight and featherweight divisions—two divisions not then present in the UFC. After the purchase, several WEC events were held in Zuffa's hometown of Las Vegas, Nevada, much like the UFC. The heavyweight division in mixed martial arts (MMA) generally groups fighters between 206–265 lb (93.4–120.2 kg). WEC aired their events live on Versus (formerly known as the Outdoor Life Network and now as the NBC Sports Network) in the United States and on TSN (and later The Score) in Canada. WEC's first live event was broadcast on June 3, 2007 on Versus from The Joint at the Hard Rock Hotel and Casino in Las Vegas. The Sports Network (TSN) is a Canadian English language sports specialty service. Established by the Labatt Brewing Company in 1984 as part of the first group of Canadian specialty cable channels, since 2001, TSN has been majority-owned by communications conglomerate BCE Inc. with a minority stake held by ESPN Inc. via a 20% share in the Bell Media subsidiary CTV Specialty Television. TSN is the largest specialty channel in Canada in terms of gross revenue, with a total of $400.4 million in revenue in 2013. The Joint is a 4,000 seat showroom located inside the Hard Rock Hotel and Casino in Paradise, Nevada. This is a common venue for classic rock and modern rock bands in the Las Vegas Valley. The Hard Rock Hotel and Casino is a resort near the Las Vegas Strip in Paradise, Nevada. It is owned by Virgin Hotels in partnership with an investment group, and operated by Warner Gaming. It is planned to be renovated and rebranded as Virgin Hotels Las Vegas. The property is located on 16.7 acres (6.8 ha) on the corner of Harmon and Paradise Road. Todd Harris was the play by play announcer on every televised WEC event on Versus, and was joined by former UFC Heavyweight Champion Frank Mir on color commentary until the spring of 2010, when Mir was replaced by UFC light heavyweight Stephan Bonnar. Fellow Zuffa fighters Kenny Florian and Jens Pulver have also filled in on color commentary due to Mir or Bonnar's absences. UFC announcers Mike Goldberg and Joe Rogan called WEC's only pay-per-view event, WEC 48 in April 2010. Postfight interviews on the Versus-televised cards were typically done by either Harris or Versus sportscaster Craig Hummer. Todd Harris is a sports announcer and reporter for NBC Sports, with current duties focused in Olympic and extreme sports. A graduate of Brigham Young University with a bachelor's degree in communications and broadcast journalism, Harris' sports media career began in 1991 with ESPN. While employed there through 2007, his workload mainly consisted of college football, the X Games, and IndyCar, which included the role of lap-by-lap announcer for ABC's coverage of the 2005 Indianapolis 500. In the past, he has also contributed to Turner Sports' coverage of the NBA playoffs and the 1998 Winter Olympics. Stephan Patrick Bonnar is an American professional wrestler and retired professional mixed martial artist. Bonnar competed as a Light Heavyweight in the UFC for most of his career. Bonnar was the runner-up on The Ultimate Fighter 1, his TUF Ultimate Finale loss to Forrest Griffin is considered to be one of the most important fights in the history of the UFC. He is currently under contract for Bellator MMA. For most of his MMA career Bonnar played the "role of the underdog", this is particularly exemplified in his fight with Anderson Silva at UFC 153. In addition to Griffin and Silva, Bonnar faced world champions Lyoto Machida, Tito Ortiz, Mark Coleman, Jon Jones, and Rashad Evans. Joe Martinez served as the announcer for Zuffa-promoted WEC events until April 2010, when he left the organization and was replaced by UFC announcer Bruce Buffer. However, Martinez made a one-off return at WEC 52 that November when Buffer was overseas for a UFC event. On January 8, 2010, World Extreme Cagefighting announced that AMP Energy would be the official energy drink of WEC. Amp Energy also sponsored three of WEC's top stars - featherweight Urijah Faber, featherweight Chad Mendes, and bantamweight Joseph Benavidez. On December 11, 2006 UFC parent-company, Zuffa formalized plans to buy World Extreme Cagefighting, to be run as a separate promotion from the UFC. Following the purchase of WEC, Zuffa made several changes to the promotion. One of the most noteworthy changes included added media exposure when WEC signed a deal to air events on Versus beginning with WEC 28. Prior to this WEC had broadcast most of their events on HDNet. While on Versus, WEC drew good ratings that averaged around 575,000 average viewers per event. However ratings ranged from 245,000 to 1,500,000. The biggest ratings draw for WEC was Urijah Faber. When Faber was featured in a main event he drew an average of 840,000 viewers. Faber was also featured in both main events (34 and 41) that drew over a million viewers for WEC. The flyweight division in mixed martial arts – as defined by the Nevada State Athletic Commission combat sports doctrine and by the Association of Boxing Commissions – groups together all competitors 125 lb (57 kg) and below. It sits between Strawweight and Bantamweight. Urijah Christopher Faber is a retired American mixed martial artist and actor who fought as a bantamweight and featherweight in the Ultimate Fighting Championship. Faber won the WEC Featherweight Championship at WEC 19 on March 17, 2006, and held the title for over two years until losing it to Mike Brown at WEC 36 on November 5, 2008. Faber is widely regarded as one of the sport's pioneers for establishing legitimacy to lighter weight classes in MMA. After retirement on July 6, 2017 Faber was inducted into the UFC Hall of Fame as a part of the Modern-era wing. WEC 25: McCullough vs. Cope was the first mixed martial arts event held by the World Extreme Cagefighting under Zuffa management. The event was held on January 20, 2007. WEC 25's main event was a championship fight for the vacant WEC Lightweight Title, between rivals Rob McCullough and Kit Cope. The co-main event was a WEC Featherweight Title bout between champion, Urijah Faber and challenger Joe Pearson. WEC 28: Faber vs. Farrar was the fourth mixed martial arts event held by the World Extreme Cagefighting under Zuffa management. The event was held on June 3, 2007. WEC 28 was the first WEC to be aired live on the Versus Network. The main event was a Featherweight title defense by WEC Featherweight champion, Urijah Faber. Jeffrey M. Curran is an American retired professional mixed martial artist. A professional competitor since 1998, Curran has fought at a number of different weight classes for a large number of promotions including Bellator, the UFC, Strikeforce, PRIDE Fighting Championships, WEC, IFL, the RFA, and KOTC. Michael Thomas Brown is a retired American mixed martial artist who competed at Featherweight in the UFC. 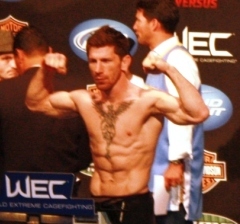 A professional competitor since 2001, Brown is a former WEC Featherweight Champion, and has also fought in the Japanese promotion DEEP, as well as BodogFIGHT. WEC 36: Faber vs. Brown was a mixed martial arts event held by World Extreme Cagefighting that took place on November 5, 2008 at the Seminole Hard Rock Hotel and Casino in Hollywood, Florida. The event aired live on the Versus Network. Palace Fighting Championship (PFC) was a mixed martial arts (MMA) organization based in the United States that was created in 2007 by Christian Printup. It ceased operations in 2009. ↑ Savage, Greg (January 4, 2007). "The Savage Truth: When is a Loss a Win?". Sherdog. ↑ Martin, Damon (August 26, 2008). "WEC shuts down 205 & 185-pound weight classes". MMAWeekly.com. Retrieved August 26, 2008. ↑ "WEC axes welterweights; announces flyweights". MMAWeekly.com. February 3, 2009. Retrieved May 1, 2009. ↑ "UFC has weight-and-see attitude for WEC - USATODAY.com". www.usatoday.com. ↑ "A UFC-WEC merger? Why not?". cnn.com. ↑ "Is there room in MMA for the WEC?". ESPN.com. October 4, 2009. ↑ "With UFC's Recent Moves, White's Predictions Might Have Been Conservative". fightmagazine.com. ↑ Ariel Helwani (October 28, 2010). "Exclusive: Dana White Announces UFC-WEC Merger" – via YouTube.